Medical Token Currency has just been recommended by John McAfee on Twitter and it has gained lots of attention from crypto investors. What exactly is Medical Token Currency (MTC)? 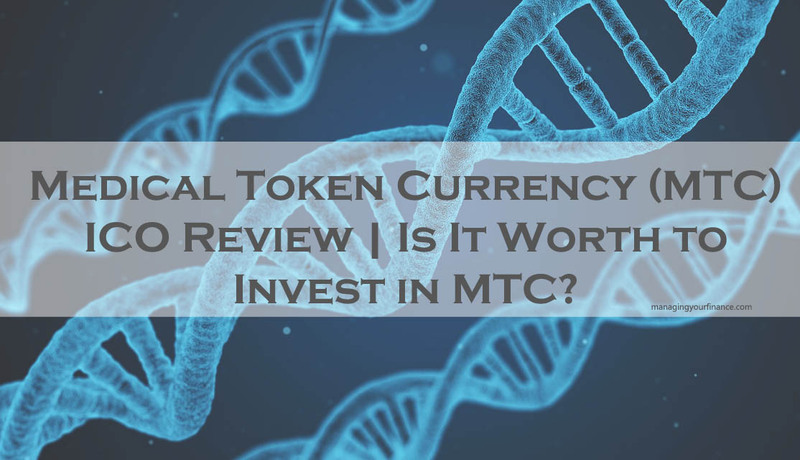 Is it worth to invest in MTC? Read this Medical Token Currency ICO review to find out more. Healthcare affordability has remained the biggest issue for many people around the world raising an alarm on who and how shall it be managed. Following the latest report that was released by American research-based organization, over 38 million citizens can’t afford the services to healthcare. Additionally, with the aging population around the world getting bigger, a new solution is needed to ensure everyone is able to gain access to quality, reliable healthcare services. Using the Blockchain technology and Artificial intelligence, this issue can be resolved. Thus, a new medical platform has been founded which suits all aiming at providing a better and affordable healthcare service to anyone in the world at any time. The digital token is being launched by a company called Docademic. In addition to creating the digital currency, Docademic is creating an entire healthcare services platform on the blockchain. That platform is called Docademic. The goal is for MTC to become the token of choice for a growing ecosystem of healthcare services provided by the Docademic platform. The DOCADEMIC platform is a single globally-sourced healthcare service platform for the public that begins with free Human Doctor-AI assisted Video Telemedicine service already in use in 20 countries by thousands of users and an associated suite of AI-assisted tools and social network for the medical community. With its simplicity of use, it becomes the ultimate resource for anyone who needs orientation in a health-related issue—a one-touch system that connects any patient with a Doctor through Video Telemedicine for free, from any country a user is located in. Docademic is already available to download for iOS and Android. Now, with MTC, the company plans to allow users to make digital currency payments through the app. It uses blockchain technology to store and retrieve patient data through patient public ID which is non-identifiable with a private identity key which links the identity to blockchain data. The goal of the Docademic app is to onload patient data onto the blockchain, creating a single, immutable source of patient data that can be accessed by any doctor. With a smartphone and internet connection one can access the Docademic mobile application which lets the patient speak to the doctor at any time anywhere which just happens as a video call but in this case its free of charge and No token need to be exchanged during this process. Artificial intelligence is also used to create new patient identities. Those identities are then uploaded to the blockchain. The MEDICAL TOKEN CURRENCY, MTC is the fuel will power all services DOCADEMIC provides they are already in talks with Health institutions, Governments and partners to make MTC the preferred Token for their own upcoming and existing medical services as they migrate to decentralized platforms. Doctors can benefit from the platform by accessing special healthcare tools and resources. Docademic offers over 600+ journals from around the world, classified by specialty. They also have a “Vademecum” (a handbook) that includes updated drug prices at local pharmacies. All of these services are provided to doctors for free. Patients access the platform through an app. You load the app and start speaking to a doctor almost immediately. The chat takes place like an ordinary video call. The video call is totally free, and no tokens need to be exchanged during this process. After video chatting with the doctor, any additional treatment, that is if recommended by the doctor, can be purchased directly through the Docademic platform using Medical Token Currency and each transaction details is stored on blockchain containing patient’s public ID, thus the platform provides medical services through AI-assisted services and being the blockchain enabled it makes it be more secure mean of any transaction through decentralized credit system. If the doctor recommends additional treatments, then you can purchase treatments directly through the Docademic platform. Who Is Behind Medical Token Currency? MTC was founded by Docademic Healthcare Technology and it has been active since 2016 and it has many users in 20 countries all around the world. Docademic Company has been providing free video telemedicine service since the beginning. All Docademic users can call Docademic doctors twenty-four hours a day, seven days a week. Docademic is basically a mobile platform that was launched as DoctorDice in the year 2013 before changing to Docademic in the year 2016. It uses artificial intelligence (AI) where it enables Doctor-AI Assisted video telemedicine service to provide to provide better care to patient worldwide. Worldwide many have been following up the fall and rise of most cryptocurrencies, especially bitcoin. Some of the results have not been pleasing especially to those who are new to this field, raising a question whether it is really worth to invest on crypto-system but after blockchain system was introduced some hope have risen to many for security assurance on their coins. In this note, MTC is giving a new hope to investors especially at this early stage of its market. Though this token is designed for the healthcare services, on its 1 billion MTC token, management and shareholder have been reserved and allocated 22% of them while 15% is reserved for strategic partners. This token can also be used as a form of health insurance to any person worldwide supporting those who aren’t capable of insuring themselves. The world is moving to a new sector where everything will be running digitally and this is the time for everyone to realize this new opportunity before it becomes too late. The ICO for Medical Token Currency (MTC) is underway until February 28, 2018. During the ICO, MTC tokens are priced at 1 MTC = 0.000035 ETH. Of the total supply of tokens, 35% is being offered to the public through the token sale. The remaining tokens are reserved for the community and ecosystem (30%), management, the team, and shareholders (20%), and strategic partners (15%). What Is Pareto Network (PXT)? Should I Buy Pareto Token as Investment? Next story What Is NANO Coin (RaiBlocks – XRB)? Is It Worth Investing in NANO? Previous story How to Avoid Cryptocurrency Frauds and Scams?